It remains a mystery how Pama–Nyungan, the world’s largest hunter-gatherer language family, came to dominate the Australian continent. Some argue that social or technological advantages allowed rapid language replacement from the Gulf Plains region during the mid-Holocene. Others have proposed expansions from refugia linked to climatic changes after the last ice age or, more controversially, during the initial colonization of Australia. Here, we combine basic vocabulary data from 306 Pama–Nyungan languages with Bayesian phylogeographic methods to explicitly model the expansion of the family across Australia and test between these origin scenarios. We find strong and robust support for a Pama–Nyungan origin in the Gulf Plains region during the mid-Holocene, implying rapid replacement of non-Pama–Nyungan languages. Concomitant changes in the archaeological record, together with a lack of strong genetic evidence for Holocene population expansion, suggests that Pama–Nyungan languages were carried as part of an expanding package of cultural innovations that probably facilitated the absorption and assimilation of existing hunter-gatherer groups. An article in the Conversation by Claire Bowern, The origins of Pama-Nyungan, Australia’s largest family of Aboriginal languages (13 March, 2018) provides further information. There is also a website, Pama-Nyungan Origins, that provides supplementary information. Again I won't be able to check the detail of the research until I can access the article into a library. As before, my interest is in the implications for my broader New England, the Tablelands and the surrounding river valleys. The Aboriginal languages spoken here belong to the Pama-Nyungan family. This research suggests that this family arose just under 6,000 years ago around what is now the Queensland town of Burketown. 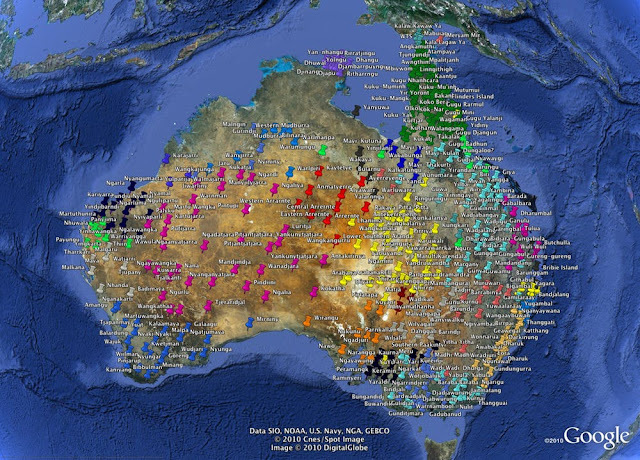 It suggest this language family spread across Australia as people moved in response to changing climate. I said earlier that it threw the cat among the pigeons because the results conflict with some other research and with the idea of continuity in Aboriginal Australia. It also plays into a previous debate about the causes of the changes that took place in Aboriginal Australia c4000 years ago and the causes of those changes. Was it a natural process of evolution or due to some external influence? The LGM (Late Glacial Maximum) forced populations to shift to survive. Parts of the North Coast were not very hospitable, so I postulated a retreat north and south. As the new coastal environment began to form, people returned. Inland, the population spread from refuge areas along the slopes and plains. The Tablelands constituted an initial barrier.As the climate eased further and the environment changed the Tablelands were resettled primarily from the coast, but also onto the slopes from the West. I think that this pattern is reflected in later language differences. In terms of the patchy dates we have, we have earliest settlement in the Macleay around 9,000 years ago, a date of over 6,000 years ago for Seelands in the Clarence, around 5,500 years ago for Graman on the western slopes. My feeling was that by around 6,000 years ago, reoccupation of territory after the LGM was well underway. from around 4000 years ago the number of dates begins to accelerate with accelerated population increase. . If we now compare this with the study conclusions that the Pama–Nyungan languages emerged just under 6,000 years ago and then spread south as part of an expanding package of cultural innovations that probably facilitated the absorption and assimilation of existing hunter-gatherer groups, we have to ask how does this fit with the evidence for New England? The short answer is that we do know and I am cautious. Professor Bowern is a respected linguist. Based on evidence she and her colleagues have posed a new hypothesis. We will have to wait and see what it means for New England Aboriginal Studies. A curiosity for me Jim is in accepting its findings you have to ask why a language originating in the Burketown area only spread in a co tine tal line South. Cape York, the Kimberleys and greater Arnhem Land, which are all roughly adjacent to source, remained unaffected. Trade or conquest are the usual transmission routes for culture and language, I would think some empirical evidence will be useful to support the propositions set out in this paper. cape York is included, John. Those are the green pins. But you are right. The reason why there was a dividing line has always puzzled me. I haven't read the full paper, so I'm not sure what supporting non-linguistic evidence is included. The very rough model that I have used before is the sheet of graph paper where each square represents a local form of speech. Within a language group there will be language chains covering multiple squares with language gradients across the squares reflecting distance. People in adjoining squares will normally be able to communicate with each other unless there is some cultural barrier that reduces contact. You get a process of change over time as words drop out of use, new words are added. The archaeological evidence does seem to suggest that trade and contact are related to the pattern of language distribution. Now how all this fits together and with these latest suggestions? Picture of deep thought! Research and writing takes time and money. Contributions welcome to help me maintain an independent voice. This blog aims to consolidate and extend New England historical material originally carried on the main New England Australia site. With time, I hope that it will develop into a living history of the broader new state New England, the Tablelands and all the surrounding river valleys. Readers should be warned, however, that the original posts are work in progress. This means that earlier posts may have been overtaken by later research or thought. I have to go through and do some updates and cross-links, but this is a slow process. Reference pages provide an entry point for themed pages within this blog. New England's Aborigines - history of New England's Aboriginal peoples.